Does oil cooler lines have washer at filter adapter? I know the oil cooler lines have a rubber/copper washer (MB033054) at the cooler. Do the cooler lines use the same washer where the lines connect to the filter sandwich adapter? Edited by Preludedude, 03 September 2018 - 05:17 PM. I believe so yes. Ironically I'm tearing all of that out of my car today and installing a mishimoto oil cooler kit. And.... I've ran into a snag that will require some modification of the original sandwich plate bolt. Interests:One stock and one not! Same washers at cooler and filter adapter. Mitsubishi is pretty good about using the same hardware for multiple parts on the car. my shaft was big i dont know what your talking about. Yup if banjo bolts then 2 copper crush washers each bolt. 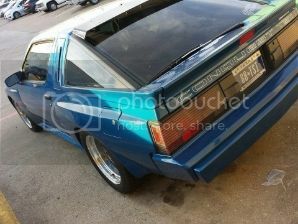 Black 87 Starion ~ Mess SOLD!!! Proud New 89 slightly Rusted Fiji Owner !! !